You may or may not know what a VPN is, but you probably aren’t using one. Well, you should. You may not see the need for it at the moment, but one day, you’ll probably consider it as important as your Internet connection. This post will start by explaining what a VPN is, how it works and what it can be used for. It will then present a few VPN providers, both free and paid. Not that clear, is it? Let’s make that clearer with an example. Imagine that you and your friend need to exchange information using a program that can only do so with computers on your local network (LAN). Unfortunately, your friend lives hundreds of kilometers away from you and you’re not at his place… The solution to this problem is easy, really. If your friend configures a VPN access on his local network and you connect to his network through this VPN, it would be just like if you were on his local network, so you will be able to exchange your information easily. In other words, a VPN enables you to simulate your presence on another local network, through the Internet, without actually being there physically. Now, imagine you route all you Internet traffic through a VPN. When you’re at home, on your local network, and access different services through the Internet, the source of the network requests is your local network. If you’re connected to a VPN and that all your traffic goes through that VPN, you’re considered by the outside world as being on the local network of that VPN. Therefore, the source of your requests is no longer your network, but the one you are connected to through your VPN! Websites and other networks you communicate with won’t see the IP of your machine as being the source of the requests, but the one of your VPN. Your service provider, on the other hand, will only see one connection: the one between you and your VPN, which is entirely encrypted. Because of this, your Internet service provider (ISP) doesn’t have a clue of what you’re doing on the Internet and, if they’re watching you, the same goes for your government. However, there’s one thing you mustn’t forget: if you use a VPN located in your country that uses the same ISP as you, your ISP will still your network traffic. However, it normally won’t know it’s yours, since the origin of the traffic is your VPN server and not your computer anymore. Given this, it’s always better to connect to a VPN located in a country different from yours. Technically speaking, a VPN works kind of like a proxy, in the sense that your ISP will only see the connection to the proxy and websites will see the proxy as being the source of the requests. However, your ISP can see the requests made to your proxy, since they are not encrypted. In other words, with little work, everything is still visible. The firewall represented in the figures above is not necessarily present. It is used to illustrate an additional aspect: if your university, company or ISP uses a firewall (or a proxy) that restricts you from accessing certain websites, you’ll be able to access those through a VPN. 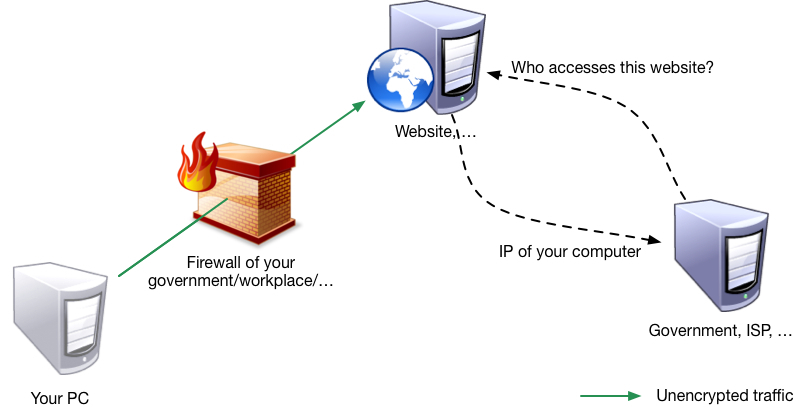 Indeed, as explained before, the only connection this firewall/proxy will see is the one between your PC and your VPN, without any knowledge of what passes through it, since it is encrypted. Therefore, while the access to your VPN isn’t blocked by the firewall/proxy, you do virtually anything you want on the Internet, regardless of the network you are connected to. Certain people, when facing government surveillance, will say they have nothing to hide. I encourage those people to read my post about this, titled “Everyone Has Something to Hide”. It was inspired by a presentation made by Numendil at PSES2013 in June, called “Si, vous avez quelque chose à cacher” (of course you have something to hide). The first thing to keep in mind when you choose your VPN is this: are you ready to pay for a VPN or do you by all means want a free VPN? (which will also have a price, it just won’t be monetary). Free VPNs aren’t always the best option for a number of reasons. The first one is obvious: if you don’t pay for the service directly, there has to be another way you are paying for it. Indeed, bandwidth isn’t quite the cheapest resource today. Free VPNs often insert additional ads on pages you visit and they sometimes sell your traffic logs to marketing companies or even governments. That the main reason why I chose to use a paid VPN service. However, it’s not the only reason. Almost every single free VPN keeps activity logs for their users, unlike paid VPNs that often keep them for a very limited time or even not at all. Let’s also note that most free VPNs limit your bandwidth and your monthly or daily data volume. The last thing is that they seldom use OpenVPN, which is the only really secure VPN protocol at the moment. That being said, free VPNs can be used to discover VPNs in general, to eventually buy one later. The next section presents some examples of free VPN providers. Regarding the installation of a VPN client and the configuration of your access, those thing are generally explained on the websites of the different providers. I provided a direct link to those explanations for each provider. Before you read on, you should know what an RSA key and the encryption strength represent. When you use a service that uses public-key cryptosystems, such as OpenVPN, both the client and the server need to know how to encrypt their messages so that they can understand one another. To do this, they use each other’s public key. Once the recipient’s public key is known, the other party can encrypt its messages using that key. Those messages can then only be decrypted by the recipient using his private key. The larger the public key, the less the chances are for the message to be deciphered. The RSA key is used for the authentication process, which verifies that you are indeed talking to the right VPN server. The specified encryption strength represents the encryption level of the Internet traffic between you and the VPN server. It is weaker than the encryption level of the authentication phase — but still strong —, so the service isn’t slowed down too much. Even if it seems obvious, this list is far from being exhaustive. It contains those that stood out when I made my research for this post. If you know an interesting one, don’t hesitate to share it in the comments and I will consider adding it to this list. The main purpose of Hotspot Shield is to protect you when using public networks. It isn’t active on HTTPS connexions, since those are already encrypted. Given this, websites you communicate with over HTTPS know the IP of your computer. You also can’t access Netflix, Hulu, the BBC, etc. with free accounts. Their normal price is quite expensive, but it looks they permanently offer interesting discounted prices. Why You Should Use a VPN by Pierre-Louis Peeters is licensed under a Creative Commons Attribution-NonCommercial 4.0 International License.